Our little family was so honored to be asked to participate in #projectstandforlove. Started by Bethanie Garcia of The Garcia Diaries, because she just couldn't bear to turn on her TV or log into facebook and see more bad news. Our world these days seems darker and more full of hate than ever before. Seconds before I opened up my blog to write this post my homepage was full of news of a Bastille Day Attack in France and my heart sank. All I could think was not again. Not another senseless act of terror. Not another wave of heartache for families left behind. It seems our news these days in consumed with these acts - city after city, day after day. Project Stand for Love seeks to do just that. To spread love and light in an otherwise dark and hateful world. The premise is simple - do something kind for someone else and ask them to pay it forward. So simple. So easy. So important. Our family makes a trip out to the boardwalk in Ocean City every summer. We go for the rides, the soft serve ice cream, the mini golf, and our favorite Caramel corn. On our most recent trip last Wednesday we picked up a tub of Johnson's Popcorn like we always do. But this time we also picked up a second tub, with the expressed purpose of giving it away. I knew it light of recent events that I'd like to drop it off to a local police station. Their job is hard, dangerous, and often thankless. The majority get lumped in and judged for the actions of a few. When we're in trouble, we hope they'll be there. Yet so often, we forget to let them know just how much we appreciate them literally putting their life on the line for those of us they've never met. Most of us would willingly do ANYTHING to keep our families and friends safe and free from harm. They treat complete strangers with the same care. We taped Bethanie's free printable to the top of the tub and walked on down to the local police station. I think they were a little surprised, that three out-of-towners would take the time to stop by, say thank you, and drop off some of the world's best popcorn. I'm still processing whether that makes me feel good, or makes me sad. Regardless, these are the important experiences I want our son to have. I want him to grow up knowing that our freedom and our safety are privileges granted to us by selfless men and women who are willing to serve and to protect. I want him to have a grateful heart. Would you join us in standing for love? You can print off the free printable that Bethanie created HERE and pay it forward to someone in need of light and love. Tuck some snack money into a redbox dvd before you return it, send cards to a nursing home, hand out water to your garbage men working in the hot summer sun, the possibilities are endless! 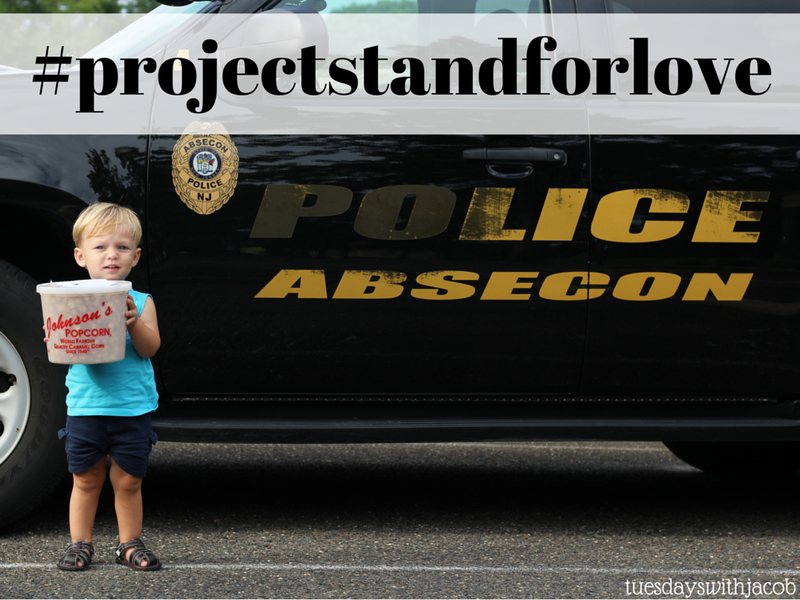 If you do,we'd love to see, use the hashtag #projectstandforlove on social media! I love this so much!!! Such a great campaign and idea!! What a great way to make someone smile!